The Gilbert & Sullivan Society of SA Inc. Welcome to website of the Gilbert & Sullivan Society of South Australia! Established in 1937, the Society has been entertaining South Australians for 80 years. 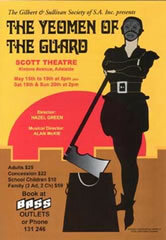 Although dedicated to promoting the works of Gilbert and Sullivan, the Society also regularly stages non-G&S operettas and musicals. Please explore our website to find out more about the G&S Society! Join our email list to be kept informed of future productions and special deals by sending your contact details here. Become a G&S member today! Membership benefits include priority access to tickets, member-only news and updates, discounts on ticket purchases and much more! Find out more about our membership program here!